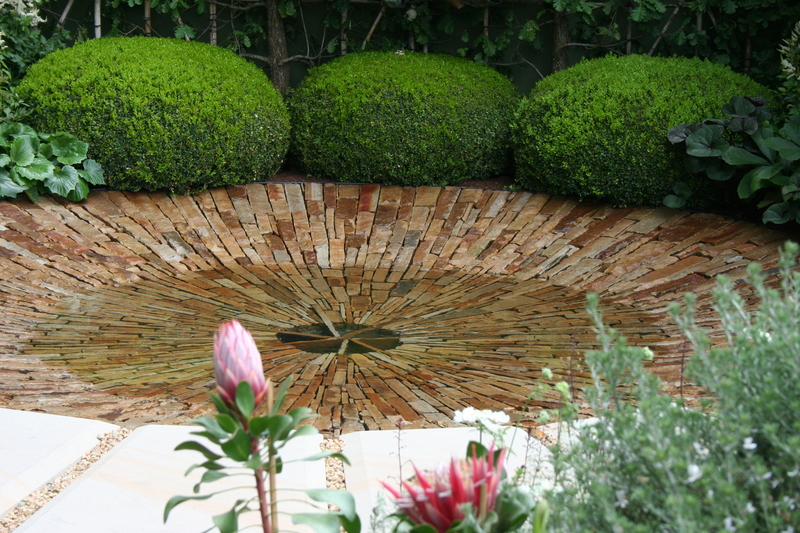 The World Vision garden, designed by John Warland and Howard Miller. There is always something at the Chelsea Flower Show to make your heart beat a little quicker, to make you stop and beam with pleasure. It’s incredible to think that the show gardens are so transitory: they are built and planted over three weeks, admired by millions of people over one week and then deconstructed. They disappear and it’s as if they were never there. The effort (and money) involved in their creation is whopping but the results are often quite breath-taking and inspiring. We were extremely lucky with the weather yesterday and I took a LOT of photos. I won’t bore you with all 250-ish of them(!) but here’s a small selection of a few of the floriferous sights from the gardens that quickened my pulse. 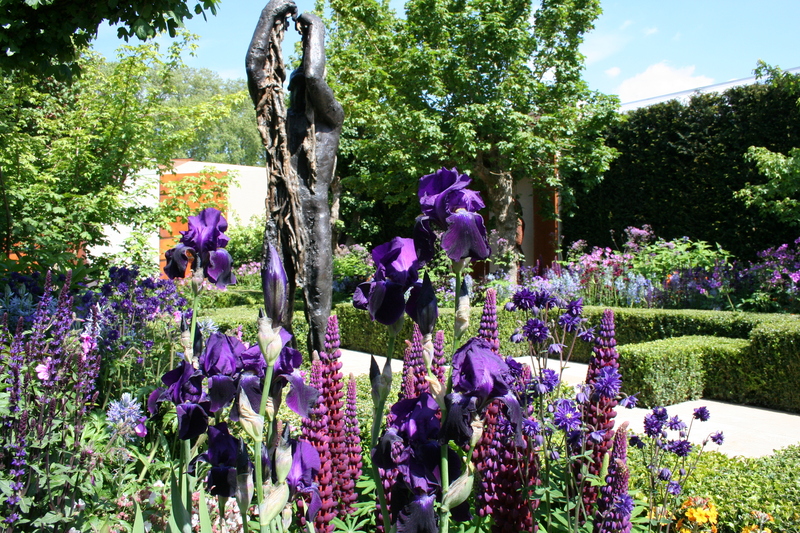 The beautiful, romantic planting of the M&G garden, ‘The Retreat’, designed by Jo Thompson. 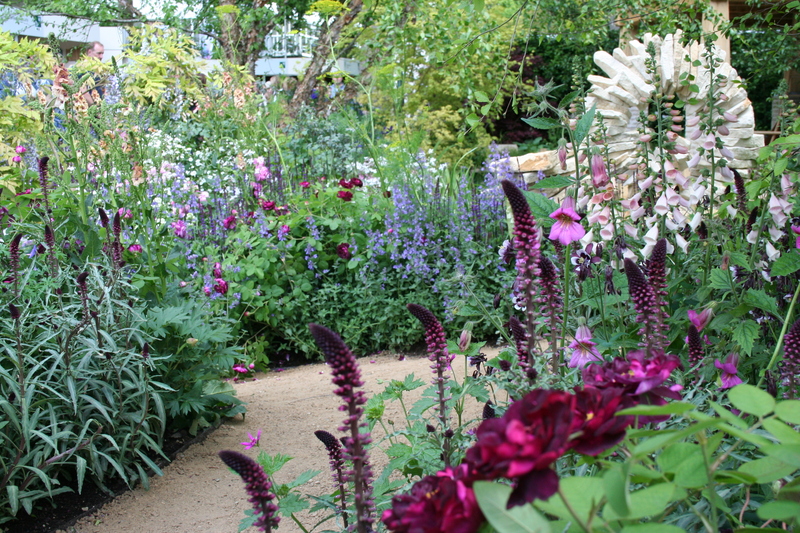 That purple spiky flower is Lysimachia atropupurea ‘Beaujolais’. Domes of clipped yew, crisp hard landscaping and frothy planting with grasses and perennials – green with pops of colour – in the Cloudy Bay garden, designed by brothers David and Harry Rich. 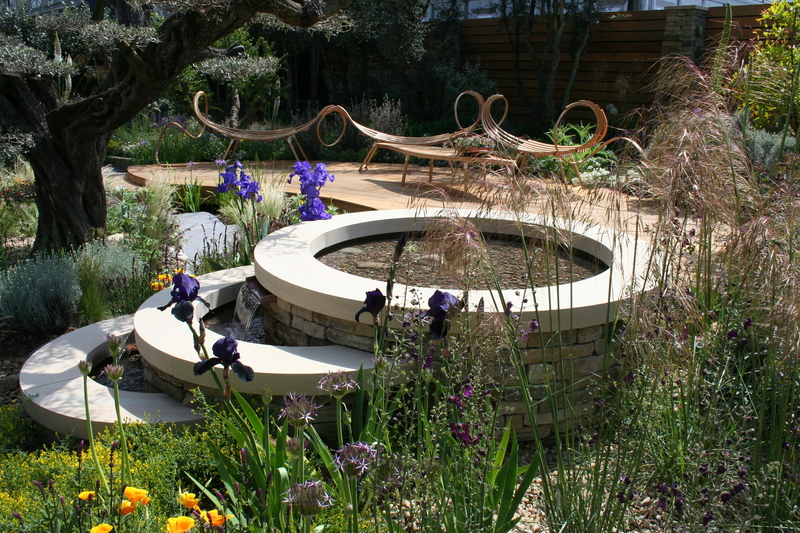 The sharp shapes, crisp edges and sumptuous planting (foxgloves, geraniums, irises, euphorbias, aquilegias, geums) of the Homebase garden, ‘Urban Retreat’, designed by Adam Frost. This also had a garden room with rooftop garden, complete with a beehive, and a secret, shady area with a lush planting of hostas and ferns. 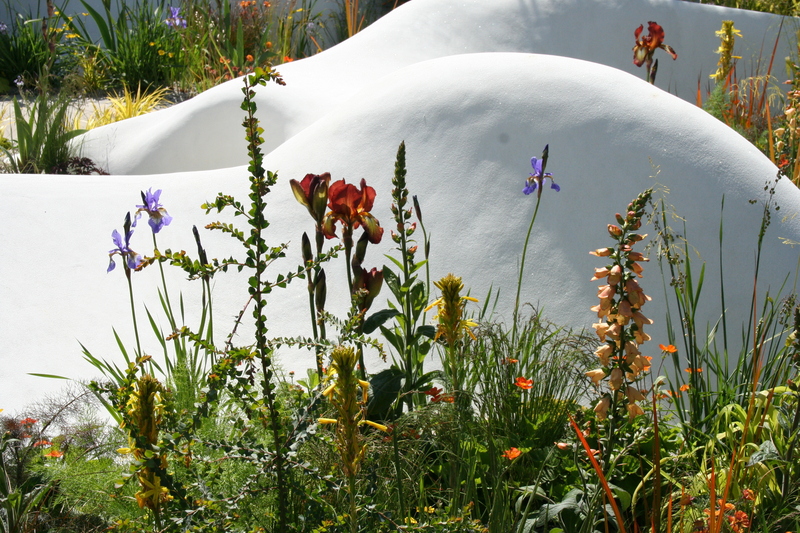 A close-up from the Telegraph garden, designed by Marcus Barnett and inspired by the Dutch De Stijl movement. 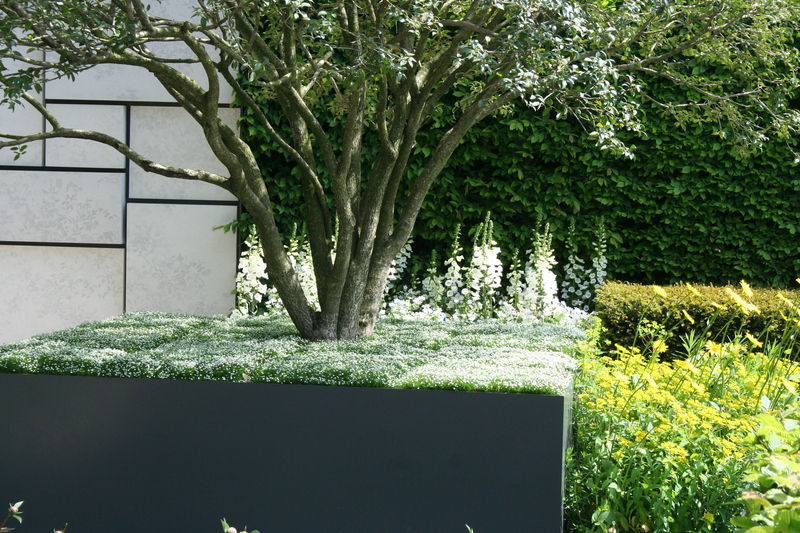 I loved the Carpinus betulus trimmed into cubes and the rich planting next to the water. Also on the Telegraph garden, a striking, multi-stemmed Osmanthus x burkwoodii underplanted with Irish moss. Apparently it started flowering yesterday morning when the sun came out. 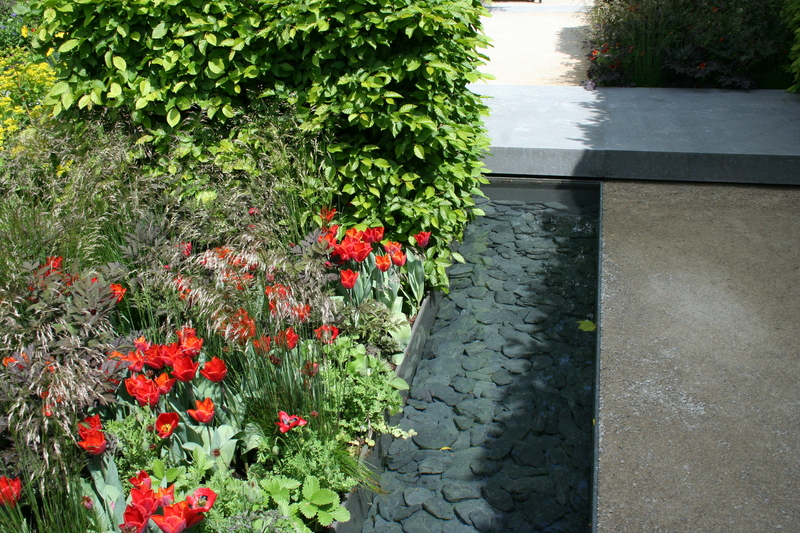 One of the most genius and beautiful water features I’ve seen – a self-filling pond. The water rises very slowly and then suddenly, as though a plug has been yanked from the middle, it wooshes and swirls away in under 10 seconds. Very clever. 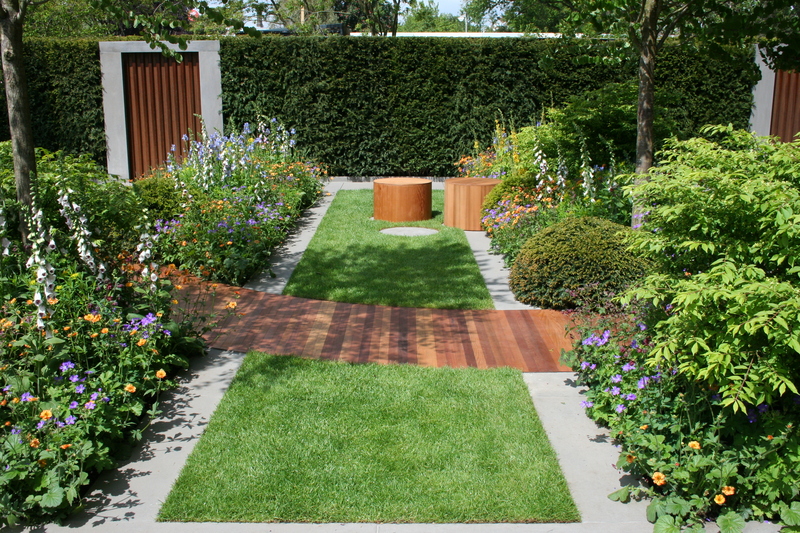 It was on the Husqvarna and Gardena garden, ‘The Time in Between’, designed by Charlie Albone. 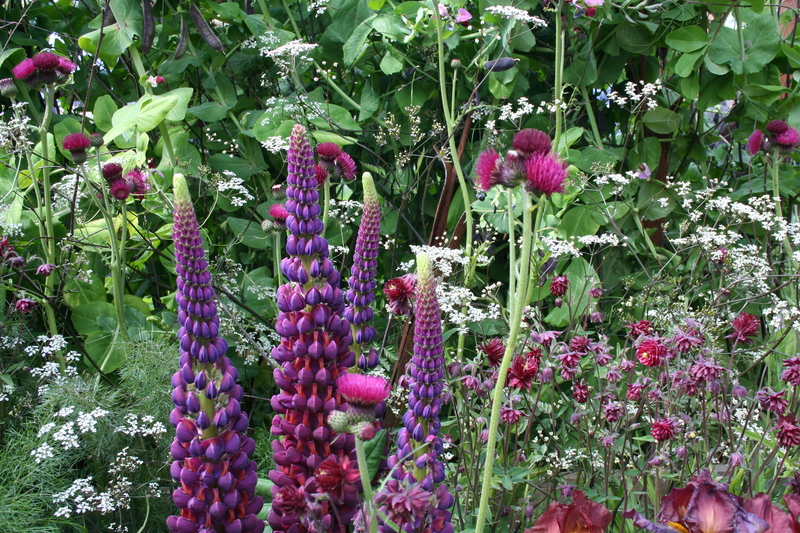 I spied this planting on a trade stand (for greenhouses) and had to photograph the gorgeous colour combination of the lupins, irises, purple-podded peas, aquilegia and Cirsium rivulare ‘Atropurpurea’. Another glorious planting combination, this time on the Royal Bank of Canada garden designed by Matthew Wilson. It features drought-tolerant and sun-loving plants, super-curvy benches and a water feature that stores water (below). More purple planting (are you sensing a theme here?!) on Chris Beardshaw’s ‘Healthy Cities’ garden for Morgan Stanley. 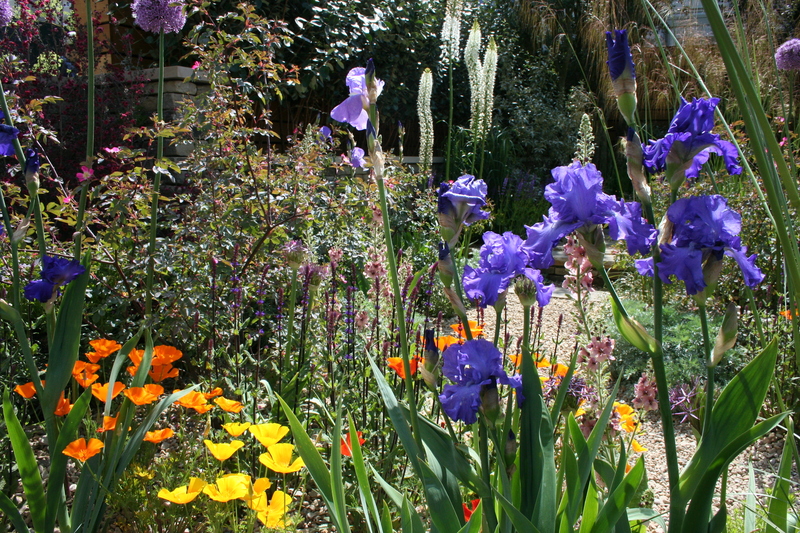 This garden will be relocated to east London after the show where it will be part of a community project. 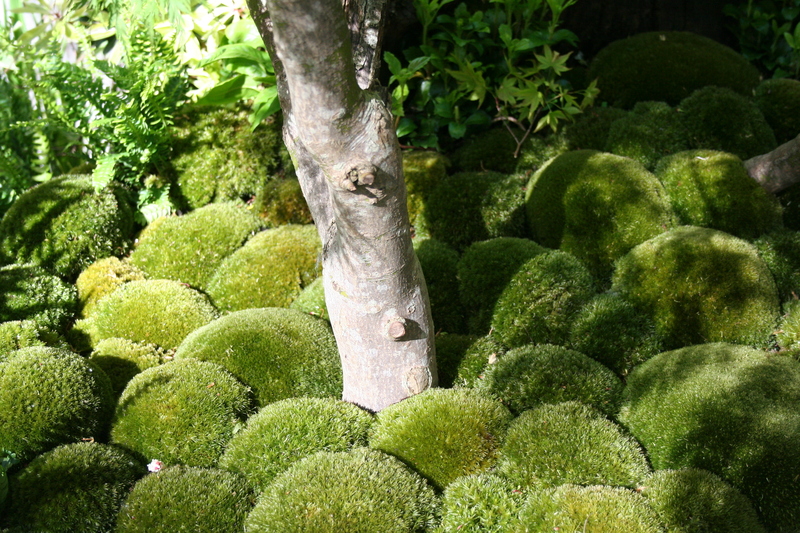 Moss balls. I waited for quite a while to get this photo without the shadow of a man’s head! 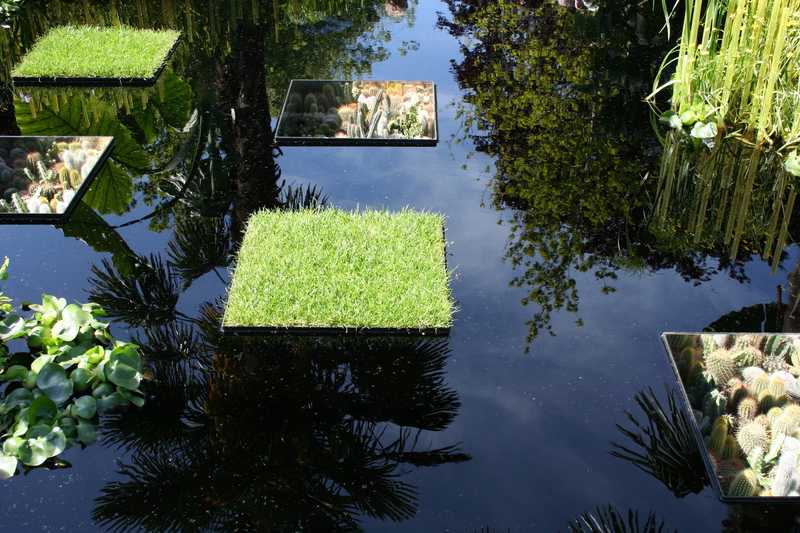 My favourite smaller garden, designed by Fernando Gonzalez. 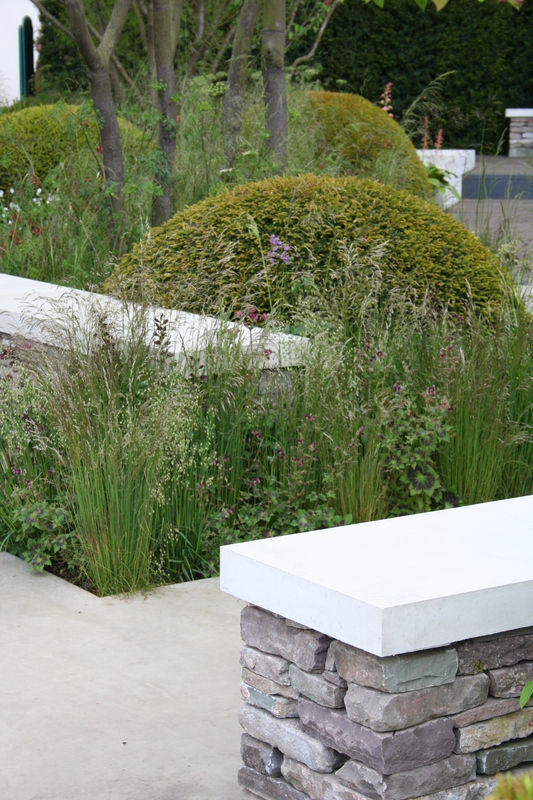 I love the way the planting stands out against the flowing white stone (Jesmonite). According to the leaflet it was inspired by the Chinese landscape of mountains and river valleys. In other news… My daughter is home from her school French trip (hooray!). Oh, I have missed her constant chatter and sunny disposition. Eldest son is due back at school from Spain just before midnight. It will be lovely to have a full house again. I’m off to make their beds and bake homecoming cake. Here’s wishing you a corker of a bank holiday weekend. Thank you Sally. Ha ha, yes, the earth did move here! The pictures are beautiful – thank you! Lovely photos. I could practically eat the M&G garden – it looks so delicious. Also, white foxgloves, I’m totally stealing that idea. If i haven’t said so before (I get very lost in Blogland) I really enjoy your blog with its clear layout and excellent pictures and see that we visit many of the same ones too.